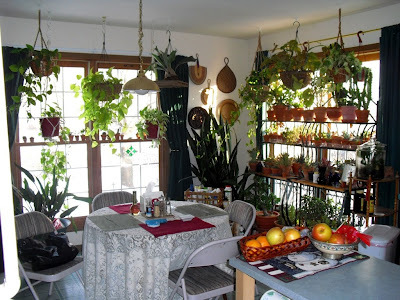 I recently realized that in the many years that I have posting pictures of my plants on the web, in my PictureTrail albums, in my Photobucket albums, and on my family website, I have seldom posted pictures of my south-facing kitchen window. This is probably because the pictures I take of this area seldom come out well. So today I tried again, and while they are not the best photographs I've ever taken, they do give a decent idea of what the area looks like. 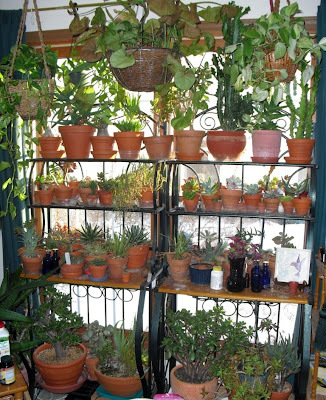 In the winter I use this window for many of those succulents that I think will do better with natural sun, or which don't fit under the fluorescent lights in the basement. In the warmer months, I move whatever plants I think might look nice to fill up the empty spaces. Two bakers racks, filled with succulents. Two Epipremnum and a Syngonium hang overhead. Hidden from view: a row of small succulents in 2-inch pots sitting directly on the window frames, and a few hanging succulents on the curtain rod close to the window. Full view of that corner of the kitchen, showing the east and south windows. There is also a row of small pots on the east window frame. These are mostly cacti, which for the most part, don't get watered between now and March. In the wintertime, the whole area is probably a bit more crowded than it should be for optimum display value. (The same can be said for all the plant areas in the house.) But overall I think I've done the best I can with what I've got. You do hang plants on the curtain rod, too? I'm not the only one, yay! Well, maybe I can do it in my new living room. The window there can't be opened anyway. Thank you, College Gardener and Julie. I appreciate the compliments. Ivynettle: The south window never gets opened, and I've never had a fog problem with it. The east window does get opened for fresh air every now and then. OMG! That's some window dressing there. Wow that is great! They are all warm and toasty! I'm glad everything and one is happy. Mine are doing great so far in the garage. When the day is sunny I open the garage door and let in the sun! Ahhh!